Heat oven to 350°F. In large bowl, stir peanut butter, brown sugar, baking soda, vanilla and egg until well mixed. Stir in peanuts and chocolate chips until well blended. Shape dough into 1 1/4-inch balls; roll in granulated sugar. Place 1 inch apart on ungreased cookie sheets. Flatten in crisscross pattern with fork. Bake 8 to 11 minutes or until edges are golden brown. Cool 2 minutes; remove from cookie sheets to cooling rack. Cool completely, about 20 minutes. Extra crunchy peanut butter can be substituted for the creamy peanut butter and cocktail peanuts. 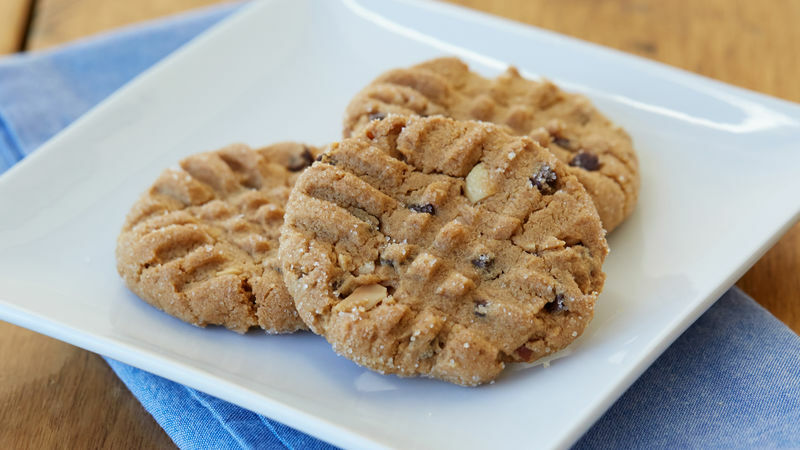 Give a new look to peanut butter cookies by pressing the bottom of a cut-crystal glass, metal meat mallet, potato masher or cookie stamp onto cookies before baking.